It's Friday!! That means I run 10 miles tomorrow! And I kind of feel like I'm getting sick. So I'm drinking crazy amounts of green tea, continuously eating zinc tablets, and carb loading with noodle soup. 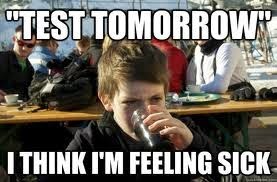 It's probably just my body trying to trick it's way out of having to run so much tomorrow. Anyways, instead of sitting here and wallowing in my hypochondria, I'm joining the DC Trifecta's Friday Five linkup as usual. Today's theme is fitness goals, so I'm sharing 5 goals for tomorrow's race. First up, my three race day goals a la this advice from Run Eat Repeat, with 1 being the hardest and 3 being the easiest to achieve. I'm not really sure how likely this is because i was over this for my curren- PDR-setting 8 mile run. But hey, race day adrenaline does amazing things right? Still feel this would be a respectable finish time considering I had a month to go from 5K to 10 miles. Because that's the most important thing after all. And here are two goals that I want to complete no matter what. During my last race I started out way too fast and burned out by the end. And that was less than 1/3 the distance of this one. So I need to swallow my pride, pace myself, go slow, and walk if I need to. I wanted to make this goal "enjoy the race" but I thought that might be too ambitious. But the course goes right along 5 miles of super beautiful California coast, so I figure I can at least enjoy the view. Q: Are you racing this weekend? Any tips to survive my first long-ish race? Good luck Amanda, I am SO excited for you and can't wait to read your recap. As for advice, make sure to hydrate and bring some sort of fuel for the 10 miler (since you will be running more than an hour). 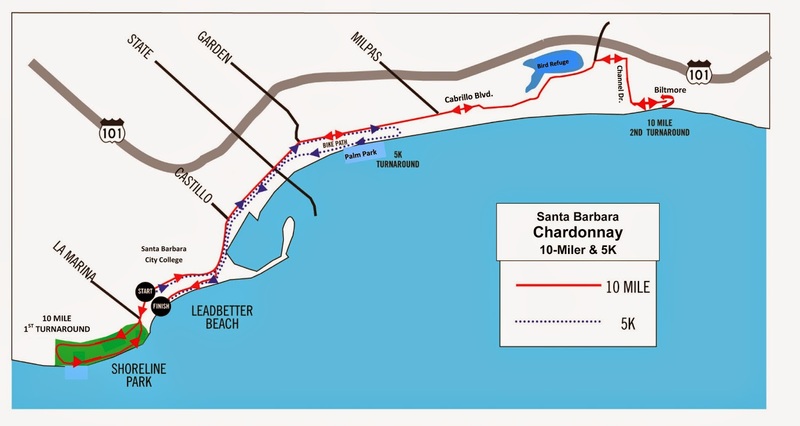 Hydrating will be key so you can enjoy ALL that wine at the end :) When I started longer distances I even walked during my water breaks b/c of my coordination (well I still do it sometimes... it looks like an awkward shuffle). Good luck Amanda!! You got this! Thanks Lindsay! And thanks for the nomination, such a cute idea! sounds awesome!! good luck :) GREAT goals! rock it out! Good luck with the race! You're gonna do great! I haven't ran a 10 miler yet but I will be in October and if I am completely injury free, I hope to complete it in under 2 hours. Awesome goals! Have a great time at the race, it looks gorgeous! I have a 5K in the morning (eep! ), wish you the best on your race! 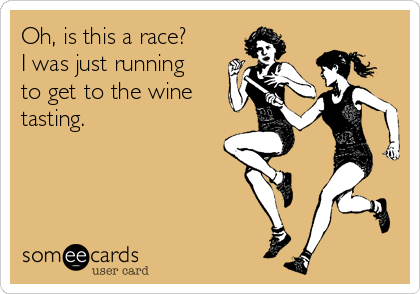 I've never heard of a race with wine at the end...sounds fun! Looks like a beautiful course too! Thanks! The race went well! Hope your 5K did too! I usually feel sick after a hard workout/race (ironic that being healthy makes you sick..I think it's just too much stress on the body). Good luck on your 10-miler! It's going to be great! I have no doubt you can meet your "A" goal -- but if not, that's what the wine is for, right? I think a good strategy I employ in 10 milers is to expect the first mile to be fast (all the race excitement), slow down and run (NOT race) miles 2-5/6 and then pick it up on the back half. Good luck! Thanks for the advice! I tried to keep it pretty slow and was only able to pick it up around mile 8.5. Maybe I can pick it back up sooner when I get in better shape like you! Make it to the wine tasting as a goal - so fun! I can't wait to hear about it. Good luck! I stop for 20 second walk breaks during my longer run. I run 2 miles and walk for 20 seconds, it's just a system that works for me. So, YES, walk if you need to. Your legs will thank you during those last few miles! Thanks Michele! I found that it was actually really painful for me to start running after walking, so I ended up mostly plowing through. It was really weird! I hope the race went well! It looks like a beautiful course and knowing that there's wine waiting at the end always helps! Good luck! I can't wait to hear how it went.